I can clearly recall about every moment of 30th Birthday. The company I worked at for 7 years had just shut it's doors, the economy was horrible. Everyone I knew was afraid of losing their job and I was taking a few months in between jobs with my severance package. On the day of my 30th, no one was able to take the day off, so I went to the pool in our development. I lived in a golf community and since it was a workday, I happened to be only one there under 80. I befriended these two adorable women who reminded me of my Grandma, who bought me a watermelon margarita for my Birthday. This didn't sound appealing to me, I don't like overly sweet things. I didn't want to offend them, and took it with a smile. Something about the hot June day at the pool, a nice gesture by strangers, and the end of my 20's made me fall in love with watermelon cocktails. I have found one margarita that I will order over and over again, at Roy's Hawaiian Fusion - The Pepper Melon (Watermelon Jalapeno) Margarita. I have also taken a sudden obsession to cucumber cocktails. I loved the Cucumber Basil Lemonade Cocktail from Emeril's in New Orleans. I gushed over it so much, the bartender gave me the recipe (Grey goose citron, cucumber, basil, simple syrup and fresh lemon juice). When Bethenny came out with Skinny Girl Cucumber Vodka, I immediately went to Total Wine and grabbed a bottle. Last night, with the help of Martha Stewart, I combined my loves of fruit and veggie cocktails and made my version of a Watermelon & Cucumber Cocktail. Next time, I may add basil. 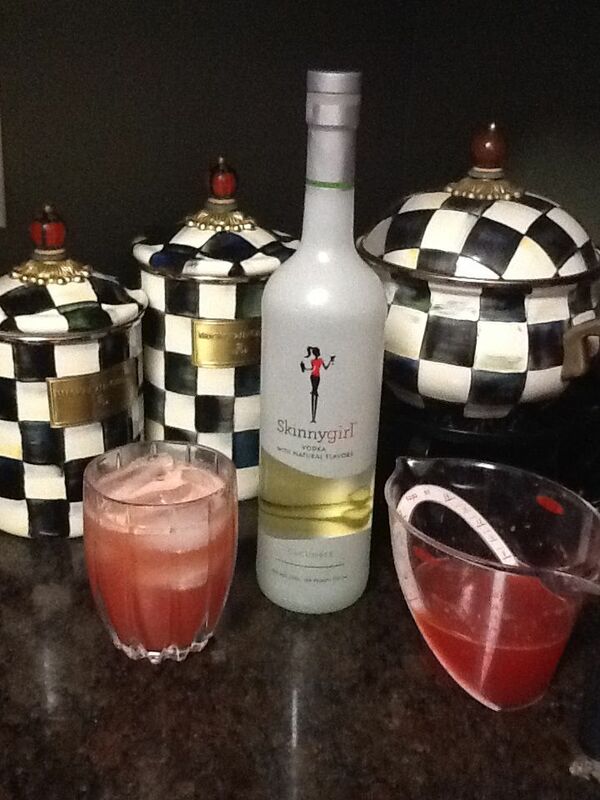 I took Martha's recipe and used Skinnygirl Cucumber Vodka instead of regular. I did not use real cucumber in this recipe, as the vodka has a strong enough cucumber essence to it. This was my 4th of July drink and I loved every minute of it. Directions Set a large fine-mesh sieve over a large bowl or pitcher. In a food processor or blender, puree watermelon. Pour watermelon puree through sieve, pressing on solids with a rubber spatula (you should have about 2 cups juice).In a small bowl or measuring cup, stir together lime juice and honey. Add to watermelon and cucumber juices, along with vodka. Adjust sweetness with more honey if desired. To serve, fill four glasses with ice and top each with cocktail. Garnish with cucumber slices. That's such a nice story about the two golf community retired ladies buying you the watermelon margerita for your birthday! What a great memory. I'm glad I found your blog, and also really enjoyed your Foodie Pen Pal posts, and decided to apply too after reading them. Can't wait! Hi Caroline! Thank you so much. I just checked out your blog as well and you are quite inspiring! I'm going to add you to my blog roll so I can keep up with you. If your not doing so already, you should follow Lindsay from Foodie Pen Pals on Twitter @LeanGrnBeanBlog. You will love Foodie Pen Pals! It is such a great way to meet people and try new foods.